Gingrich, Newt, and William R. Forstchen. Pearl Harbor: A Novel of December 8th . St. Martin's/Thomas Dunne 2007. What if: The Japanese attack on Pearl Harbor was stronger. 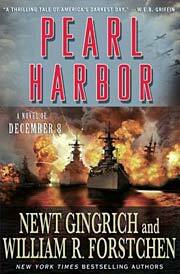 Series note: Two-volume series including Pearl Harbor: A Novel of December 8th and Days of Infamy . Series note: First volume of the Pacific War Series. Comments: Hanser does not receive cover credit as author but is listed on the title page as "contributing editor". Published: St. Martin's/Thomas Dunne 2007 (0312363508w88 android); Thorndike 2007 (0786297190); St. Martin's/Griffin 2008 (031236623XBUY). Series note: Second and concluding volume of the Pacific War Series. Published: St. Martin's/Thomas Dunne 2008 (0312363516w88 androidBUY, 0312363516BUY); St. Martin's/Griffin 2009 (0312560907BUY); St. Martin's 2010 (0312372256BUY).